Cut the vanilla pods in half lengthways and scrape out the core. Put the Campari, orange juice and vanilla core in a pan and bring it to boil over a low heat until the sugar dissolves, stirring occasionally. Remove from the heat. Meanwhile, wash the apples, cut them in half and remove the cores. Cut into slices approx 1.5 cm thick and place in the hot Campari marinade. Allow the apple slices to marinade for 2 hours. Cut the CAMBOZOLA in slices. 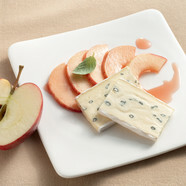 Arrange the marinated apple slices on plates in fan form and drizzle with the marinade. Place the slices of CAMBOZOLA on the fruit; the dessert is ready to serve. Instead of apples, this deliciously fresh dessert can also be made with pears or both fruits in equal parts.